Life in the middle of many firsts. This will be a great exercise for me as I've been struggling both with seeing the blessings through the fog and with looking forward to anything. See post below. But today is a day of hope, so here goes. 1. Manboy graduated from high school with many awards and honors. His was the first class to graduate from the new High School in town. The school focuses on project based learning and has a strong culture of community service. Each of the graduates wore TOMS shoes along with their cap and gown. The ceremony was awesome with slideshows and speakers that really let our family know what a unique opportunity this had been for him. Most of our family including Manboy's birthmother gathered for graduation. It was a blessing to have so many of them here at once. 2.Manboy went off to a college that supports the values established in his high school years and gives him many opportunities to explore the man God is leading him to be and the field of study he wants to pusue. 3. Watching my church move from survival mode to truly looking to the future and seeking to be in ministry. This has been such a blessing for me. God is doing great things through great people here. 4. The joy of participating in Elastigirl's ordination and hanging out with some of the RevGals just a few weeks ago. 5. My loving husband, Gifted and Talented who stands by me even when I can't see any of the blessings around me. 1. The return of joy to my daily life rather than rare glimpses. 2. Joining my congregation in developing a long term vision and living out our mission. 3. BE 5.0 - Looking forward to fun on the high seas. 4. Making/Taking time with G&T for some re-creation. 5. Let's let this be a mystery and see what God has in store. Wow, I haven't posted here in a loooooong time. But today I feel inspired. In fact, I feel joyful, which is a rare thing in the last few months. But today, I woke up dreaming I was laughing. I can't remember with whom or about what, I just know I was laughing in my dream. It was wonderful. For the last few months, I've been working against what might be called "low grade depression." I believe most of it is situational - empty nest, job stress, son rolling his car on his way home from collge in October (he's fine), parishoners facing deep grief and serious illness, son having knee surgery for earlier injury, job stress, m-i-l diagnosed with colon tumor (probably not malignant, we'll know next week), job stress... Most mornings I wake up from an anxiety dream in which I'm stressing over one thing or another. The scenarios change, but the feeling is still the same. I'm seeing a counselor, but not often enough. I have had glimpses of joy lately. My weekend with several of the RevGals surrounding the ordination of Elastigirl was the first time I had played in a long time. I was reminded of how much fun I had on BE 1.0 and began to look forward to BE 5.0 with a little more enthusiasm. Then life intervened and I fell back into the blues. HOWEVER, this morning I awoke laughing (at least in my dream) and even praying a prayer of thankfulness for laughter in my dream. I am hopeful for today. Lord, thank you for the gift of joy and hope and laughter. Let me fully immerse myself in your joy this day. Amen. 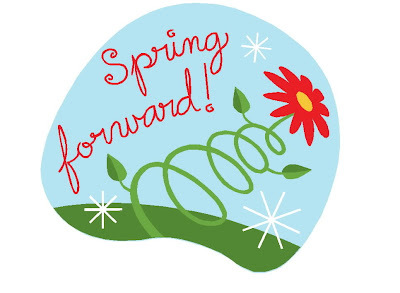 Jan at RevGalBlogPals writes: Whether we liked it or not, we all "sprang forward" with the change to daylight savings time in the USA this past Sunday. There is lightness and brightness slipping in as spring approaches, so let us consider what is springing forth in our lives right now. Name 5 things that are springing forth, possibly including :what you hope for, what you dread, what you observe, what is concrete, what is intangible. 1. The children's and youth ministry at my church is springing forth. It is still small, but growing both in size and in energy. It is so exciting to see the enthusiasm the whole church is developing for this ministry. We are blessed with great people committed to serving and great kids! 2. Manboy is getting ready to spring forth from the nest. Graduation is getting nearer and nearer. College acceptances have come in. He's close to making a commitment. Mom has mixed feelings about this of course. I'm so proud of the young man he's grown to be. 3. Spring is springing forth here in the summer climes. The Bradford Pears, Redbuds, and Crepe Myrtles all have blossoms on them right now. The thermometer on my patio read 88 yesterday afternoon. You see we don't spend long in spring. Summer temps will be here shortly after the equinox. 4. Hmmm. What I'm hoping for? Energy. I'm hoping for some energy to spring forth sooner have rather than later today. The sun is trying to peek through the clouds. That's kind of how I feel. My get up and go is trying to peek through, but it is covered by a layer of lethargy. 5. I would also be happy if my sermon and the class on prayer I'm teaching next week would spring forth sooner rather than later. Both are tromping around in my brain, but neither is as yet flowing forth. As I type, I realize this is really a prayer of gratitude and petition. Lord, hear my prayer. Amen. One of the local churches has a men's flag football team called Usta Could. I think this blog should perhaps be called Usta Blog. It seems the demands of solo pastorate and the convenience of fb have come between my blog and me. So today I'm taking a few minutes to do this Friday Five from RevGalBlogPals. There are many perks in my life for which I give thanks and then there are some that make everything right in the world during the moment I am enjoying them. I'm wondering what a few of those things - five to be specific - are for you. The hard part of this will be keeping it to five. 1. Fuzzy Socks. We are having our first cold snap of the year (just cool to many of you) and I'm grateful for my fuzzy socks to keep my feet warm. 2. In tribute to Mindy, I must also say clean underwear. Mindy has certainly raised my awareness of the blessing of clean underwear and the fact that many don't have them. 3. Hot tea and cocoa in a favorite mug. 4. Books - lots of different books - from spiritual to murder mysteries. Comfort books. Challenging books. Touching books. Funny books. Lots and lots of books! 5. The times when Manboy comes to talk to me about the things in his life. It's an interesting time of pushing for independence and touching base to make sure the roots are still here. So these conversations are now perks and less the norm and I cherish them. This would be my all is right with the world moment for now. I was thinking today as I drove away from my hairdresser's after getting last week's cut modernized, "I think I'm ready to face 50." I've got my little red car with a sunroof, my cool iPhone with the little red case, and a cute, modern (slightly defrumping) haircut. Then I began to think a little deeper. I wondered why a car, a phone and a haircut seem important to me for facing 50. To me they are all the "right"signs that I'm NOT.THAT.OLD. The hairdresser asked me how I felt about turning 50. I don't feel "that old." First I just dont' have time to think about, much less actually have, a birthday next week, so it really hasn't sunk in. Second, since I'm doing something brand new - again - I don't feel like I've been doing the old same thing for a long time. Most of the time I feel incredibly inexperienced so therefore, not at all old. If I was old, I might have some wisdom. If I was old, I might have a clue what I'm doing or what I should be doing more than half the time. So I decided to reconsider what makes me ready to face 50. In general - Life.Is.Good. I'm doing what I pictured myself doing 8 years ago when I left teaching and headed to seminary; pastoring a lovely little church where I've found folks to love and who love me. I've got a great husband and a great kid and lots of family and friends who love me. These are the things that make facing 50 okay. But the zippy red car with the sunroof, the cool iPhone with a red case, and a good haircut are all icing on the cake! Jan at RevGalBlogPals writes, "Since posting about decluttering, I am still muttering about the need for it in my house. How about you?" 1. What things do you like to hang on to? Memories from my and my son's growing up years. Family heirlooms and artifacts. I have the plates from all the Methodist Churches my grandmother attended, a cedar chest from my great aunt, a china doll that belonged to my great grandmother, and some depression glass. 2. What is hard to let go of? Very little actually. In spite of what I've written above, I don't keep lots of stuff. Neither G&T nor I have much clutter tolerance, so stuff goes out fairly easily. 3. What is easy to give away? Clothes, small appliances we'll never use. manBoy struggled with giving away toys...when he was little, but we learned if he knew it was going to someone specific who needed it, he was good with it. We also would put things in storage for 6 months. If they weren't missed, then out they went. 4. Is there any kind of stumbling block connected with cleaning out? Time. I've been trying to take time each day/week to declutter my desk at the office. It's so much more peaceful and productive when things look nice! If I could learn to not clutter my calendar with too many obligations, I'd be in good shape. 5. What do you like to collect, hoard, or admire? I have a bear collection, stuffed and other, that I haven't added to in a long time. I have a collection of Willow Tree Angels in my office, but I'm picky. I collect the ones that seem to me to be different ways we come before God (contemplative, victorious...). My most prized "collection" are the friends I've made along the way and on the web. Bonus: Tell us about recycling or whatever you can think of that goes along with this muttering about cluttering. The person I most admire for reusing, reviving, repurposing stuff is Mindy. Check out her blogposts here, and here to see just a couple of the great things she's done. Solved a problem. Running a Test. This is a test of the emergency copy and paste system. Over at RevGalBlogPals, Singing Owl waxes poetic about the anticipation of spring, the blessings of summer, and these (for her in Wisconsin) final days of summer known as dog days. She asks the following questions. 1. What's the weather like where you live? In a word, HOT! We are expecting a bit of a cool down next week when the highs will be 98 and 99 instead of 105-106. Yesterday marked 13 days of triple digits. 2. Share one thing you love about this time of year. The anticipation of a new school year. Since I was little, I have looked forward to this particular new beginning. I was a teacher for 20 years so from age 6 until I finished seminary, my life revolved around the school calendar. Then I spent a couple of years in the conference office and really missed that sense of new beginnings. This year, I'm in a local church and we are celebrating back to school with a blessing of the backpacks on August 22. We are also in the process of kicking off some fall classes and small groups, so there is definitely a sense of new beginnings. My late August birthday gets all wrapped up in that sense of new beginnings as well. There have been others, but I know I started 5th grade, college, and my first year of teaching on my birthday. I preached one of my first sermons (they were few and far between back then) on my birthday and organized a potluck for the same day. The whole church sang Happy Birthday. It seemed like I had just planned a big ole party for myself! 3. Share one thing you do NOT love about this time of year. Getting in and out of a hot car to go from place to place. It just zaps me and saps my energy. I do as many errands as I can early in the morning. Also, sweat. 4. How will you spend your remaining days leading up to autumn? Well that's quite a number of days here. When I was teaching, I used to joke that teachers had to be prepared to teach the season of fall on the day it happens. Planning your Halloween costume is a gamble here. It could be 35 or it could be 90. So autumn or fall here is more a matter of what's happening than how the weather feels. Besides the start of school, the biggest sign of "fall" is the beginning of the football season both professional and high school. As for what I'll be doing, Manboy is starting his senior year in high school next week, so we have college visits on the calendar along with senior pictures and all the rituals that accompany this beginning that leads to an ending that leads to a beginning. It's hard to imagine that this time next year we'll be sending him off to ?????? 5. Share a good summer memory. Swim lessons - both my own when I was little and Manboy's when he was little. Swimming was one of the few physical activities I could do moderately well. I love being in the water and I'm thinking it's just silly that I let something like how I look in a swimsuit keep me from enjoying that more often. The Manboy memory involves they day he learned to dive. He was sooo excited and proud of himself. Later, he sat at our kitchen table and said, "Mom, when you dive in the water, you get more speed." I asked if that was a good thing. A look of glazed ecstasy came over his face, his little hands raised as in praise and he said, "Speeeed is gooooooood!" I swore then he wasn't driving till he was 40. It's a miracle that he has his own wheels now. Bonus: What food says summer to you? Watermelon. The taste. The color. The juice running down your chin. Just over four years ago, I blogged this. It seems not much has changed. I am once again in a new beginning and about half the time I feel like I have no idea what I should be doing. I'll have another birthday in a few days. One that AARP recognizes. I still feel like I'm in mid-life, and once again, I'm a rookie. I do sometimes long for the days when I was established in my career, and had a pretty good handle on what I should be doing. I'm not longing to go back to that carreer, just that state of comfort. This week's lectionary and sermonizing has certainly reminded me who I should be leaning on and trusting, and it's.not.me. Almighty God, who always moves with clarity of will and singleness of purpose, help me to live and work with certainty in an uncertain world. Light a lamp before me so that my feet do not stumble. Make my path clear so I may never wander from your chosen way. I pray in the name of Jesus who comes to make your way clear before our eyes. Amen. RevGalBlogPal meme for the day is Memories. This is particularly appropriate since I attended a meeting for parents of high school seniors last night. The meeting was about the memories the kids will make this year at homecoming, prom, senior parent night, senior trip, and graduation. But, it brought back many memories for me. It seems like only yesterday that we brought our little bundle of joy home with less than 24 hours notice. How can he possibly be a senior already? 1. Memory from childhood - camping trips: some in our state and some beyond, hot, cold, desert, mountain, tent, pop-up trailer, family, Girl Scouts - one that stands out is camping on the side of a mountain using a large rock with a flat top as our table. I still don't know what kept our tent from rolling down the hill with us in it! 2. Teenage Memory - recently reminisced about my group of friends in high school. We were called "The Grapevine." (Something to do with kissing and telling.) Even though we weren't in any way an official group, we all had t-shirts that said "Grapevine" on one side and "Great in '78" on the other. I still have pictures. Saw most of these friends a couple of years ago at our reunion. 3. Young Adult Memory - Which one to pick? Our wedding - was just barely not a teenager any more or bringing Manboy home - barely still considered young adult by then. Both were blessed days. We met Manboy's birth parents on a Sunday night at the hospital the day after he was born. We gathered on Monday for a placement ceremony in the hospital chapel. Pastors from both families were there. We prayed. G&T sang. Manboy's birthmother placed him in my arms. I will never forget my joy and my pain for her. 4.Memory from this Summer - Again, which to pick. Ordination on June 7th was awesome and awe inspiring. Triumphant music. Family gathered. Vows. Hands on head. Done at last! Pie in the face at the end of VBS because the kids exceeded my number challenge by 5 was exciting and not too gross. 5. A memory I hope to have - working today on planning a getaway to celebrate our 30th wedding anniversary in October. I'm not gonna link to the place just yet because I'm waiting for G&T to check his email and approve. I don't want you snatching the room right out from under me! I'm a mom, wife, and second career pastor. I am recently ordained in the United Methodist Church. I love watching God's healing work in the lives of those around me and in my life as well.